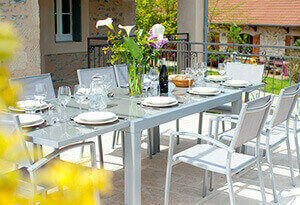 La Ferme du Cayla has all the facilities and equipment you could ever need for your family holiday. We have thought of everything so that grownups can enjoy a relaxing stay knowing that their children are entertained and discovering things in a safe and natural environment. Come and have a dip in our 32ft. outdoor pool or 16ft. paddling pool for smaller children. Spend some pleasant and relaxing time with your family on deckchairs under parasols, or at the waterfront beneath the glorious sunshine. At La Ferme du Cayla we haven’t forgotten that holidays are for parents too. Our adults only heated 30ft. indoor swimming pool – with the natural added bonus of beautiful views of the Célé Valley – is conveniently just a few feet away from the wellness centre. Choose how best to enjoy your quiet time. 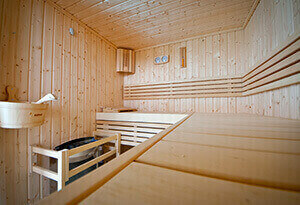 The wellness centre is a relaxing retreat for parents. At our spa, which includes a sauna, steam room, relaxation room and treatment room, you can book a professional massage and feel the stresses of juggling every day life slip away – and feel like you are really on holiday. The outdoor Jacuzzi, situated under a pergola with magnificent views of the Célé Valley, stays open later at night and is beautifully illuminated by LED lights or starlight – the choice is yours! 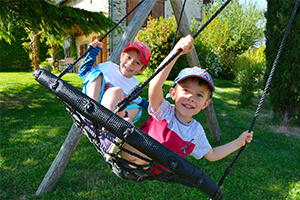 During the high season (July-August), La Ferme du Cayla offers a relaxing holiday for parents whilst your children have fun! We propose two clubs depending on age: Baby club from 3 months to 3 years; Kids club from 3 to 10 years. They will have fun and get involved in educational activities. One thing’s for sure – they won’t get bored! 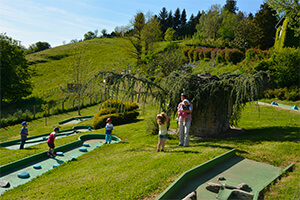 Mini golf is such fun for all the family and we have our own 9 hole course just a few metres from the Main Village Square. The course has a beautiful view of the valley and is easily walk-able with each hole posing its own difficulty. For fun we have based each hole on an attraction in the region including the Pyramid of Champollion, the Célé Valley, the menhirs and dolmens (large standing stones) and underground caves. 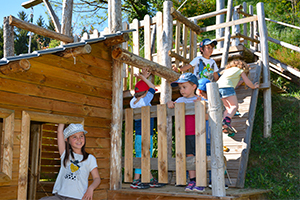 La Ferme de Cayla has many play areas available for toddlers and older budding explorers. There are swings, a sandpit, natural wooden games, treehouses, table tennis, a large 4 metre wide trampoline and, for the older kids, a 25 metre long zip line… ours really is a children’s paradise. 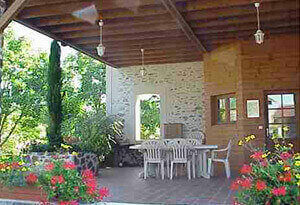 The true heart of La Ferme du Cayla is the Main Village Square which is an ideal place for your boules tournaments. The pretty fountain and flowerbeds are reminiscent of traditional French village squares, which will add an extra touch of authenticity to your holiday. There’s a real pleasure in going to collect fresh eggs in the morning. To make your holiday both a revitalizing and educational time, we have set up a small farm 200 meters from our cottages, which is home to two donkeys, sheep, goats, chickens and rabbits. 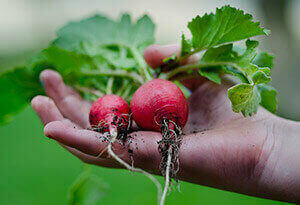 Your kids will be delighted to visit and pet our animals and help our farmer Rémy feed them all. If you want to get more involved we are happy to arrange a tour of the large farm belonging to our neighbours Sylvie and Michel, who produce cabécou (goat’s cheese typical of the region) or else organise a visit to the farm of Jean-Pierre’s brother who breeds Aubrac cows. La Ferme du Cayla has a well-tended herb garden and a large ecological garden growing several varieties of seasonal vegetables. Adults and children will discover the local scents of the aromatic herbs and pick the vegetables that are ready to be eaten on the advice of our expert, who will also share his insider gardening tips with you – we like to combine holidays with education for your kids. Located just 5 minutes walk from the village, our private lake of 70 metres by 20 metres offers a place where you can spend time getting back to nature. 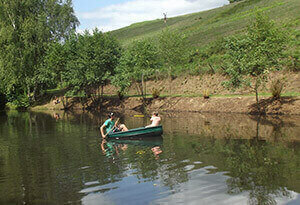 This is an ideal place to practice or to learn how to fish from the banks or from the safety of the boat. We will teach and help you to catch carp and other fish from this small lake, which may be eaten in the evening on the barbecue, or else you can simply relax there; whatever takes your fancy – the lake provides a lovely distraction for the whole family. 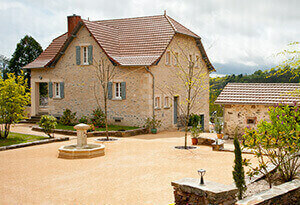 A stay at La Ferme du Cayla is a real gourmet experience. Our restaurant serves breakfast, lunch and dinner on a beautiful outdoor terrace made from authentic stone, located between the bar and the traditional bread oven (you can eat in the inside restaurant in case of bad weather). You can enjoy local gourmet food and taste the vegetables and herbs from our garden, all thanks to the talents of our French chef. Our region is known for its Cahors wine, made from the Malbec grape. It was a natural choice to install a wine cellar where you can browse and choose your vintage for yourselves from the many bottles of red, white, rosé and champagne. Once a week you can take part in wine tastings with a local producer. 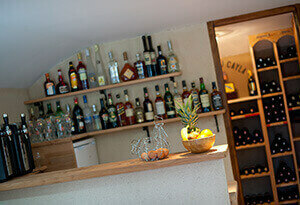 The wine cellar and bar area is for adults only – children have their own bar which only serves drinks non-alcoholic drinks, and is situated near to the traditional bread oven. A holiday in France would not be complete without savouring delicious warm French bread, indeed it comes straight from our wood-fired oven. At La Ferme du Cayla we will not only ensure a fresh supply daily but you may also take part in activities once a week where you can refine your baking skills and learn how to bake authentic bread or create your own pizza. 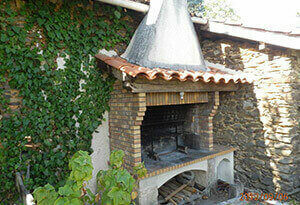 A barbecue is at your disposal if you want to fully enjoy the summer evenings. 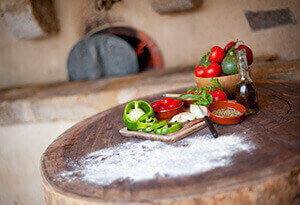 Our chef will also organize barbecue evenings where all families will gather for a friendly dinner.